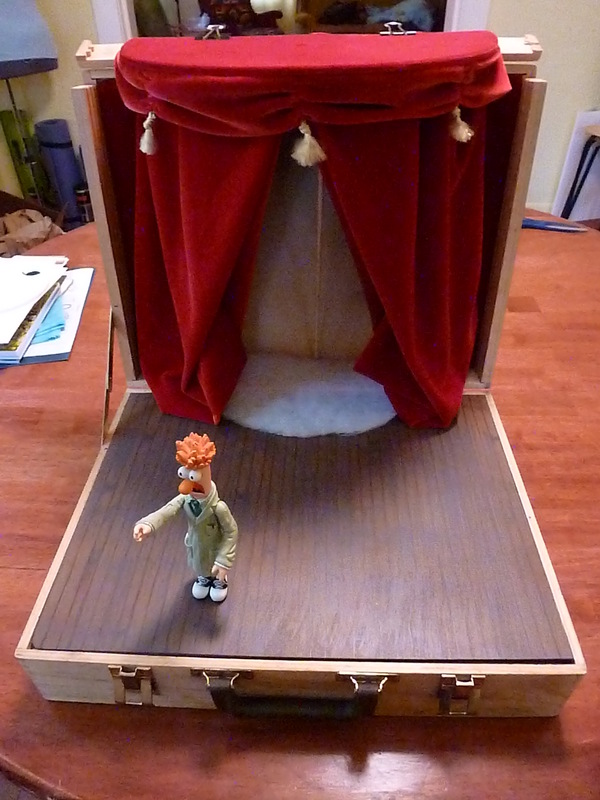 Over the last few weeks, I’ve been working on a “pop-up” stage for a stop-motion animation a friend of mine, the lovely J. Scott Winegarner, is putting together. I suppose I wasn’t real diligent about photographing the process, however I’m lucky to report that he snapped a before picture. I couldn’t help but get excited–I could instantly see the finished product in my head. Frosty the Snowman, the man, the legend, would get red, velvet curtains. He deserved them! And I was just the person to make them. However, when Josh brought it over to hand it off, there was one thing irking me… the stage. “I didn’t think it was possible,” he said. All in all, it was a pretty easy process. I headed out onto the porch with the stage floor and a can of brown spray paint (Montana Gold Acrylic Spraypaint in G1450 Hot Chocolate), and gave it one generous coat. Then I let it dry in my basement overnight. The next day I drybrushed it with a slightly darker brown, using a stiff 2” brush. I didn’t have a good brown in my modeling paints kit, so I mixed some black primer, grey, red and yellow together until I got a color I liked. 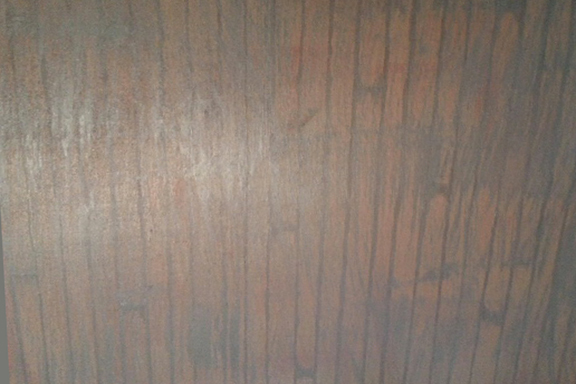 Once that was dry, I took a brown sharpie and drew on the floor board lines, and then covered those with the brown paint I mixed, made just a touch darker, using a #1 liner brush. I also used these paints and brush to add in little lines to make the floor boards look of varying lengths. Then using a #2 flat brush I just kind of shaded in those lines to make them look worn. Then I added a touch of grey to the brown mixture and dry brushed it again. 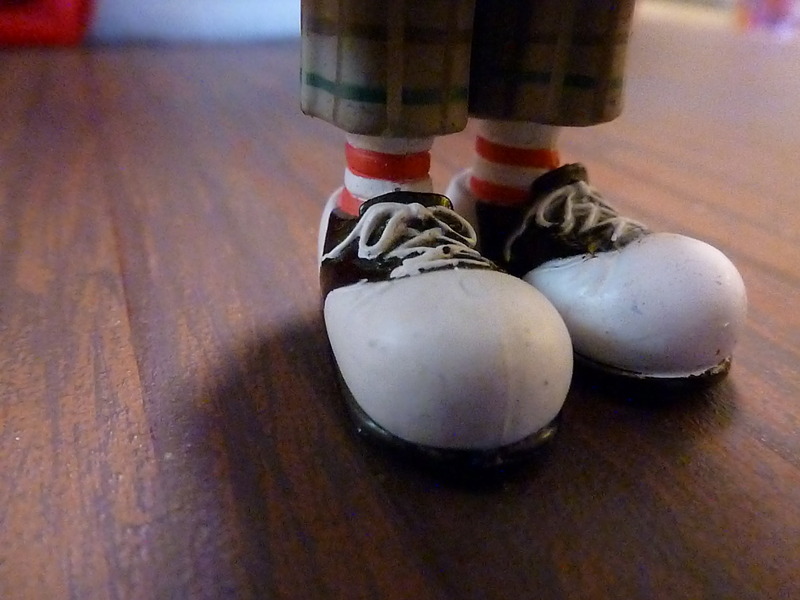 Here’s a shot of Beaker’s feet on the floor, for scale. Once the floor was complete, I got started on the curtains. Josh had already set up a pretty good system with the top part – it has three tiny eye-hooks hooks hanging from it, and then a curtain rod was made from armature wire. To make the curtains, I just cut them to width+hem and lengthx2. Then, I folded the cuts in half, outside-in, and sewed them up the sides with my serger. The remaining side was left unfinished. This made it easier to add a mechanism to draw back the curtains. 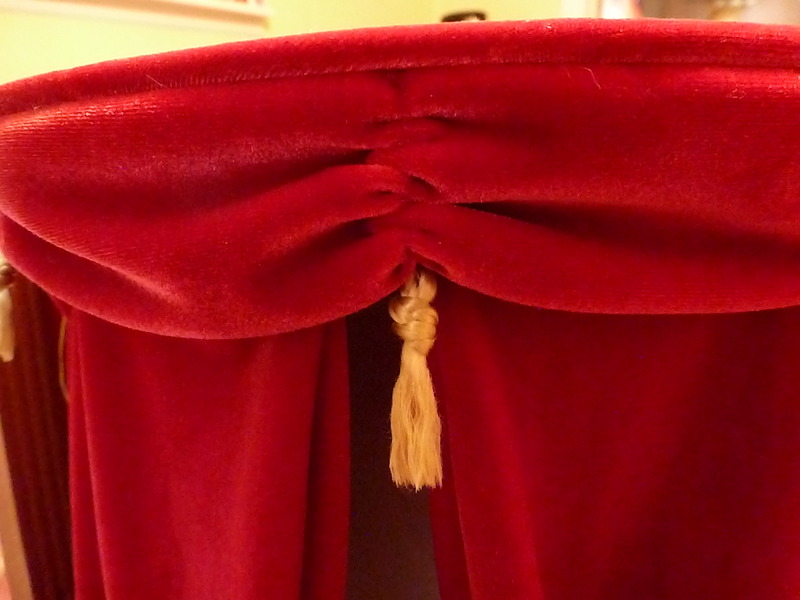 Then the curtains were pinned onto the rod using safety pins. Yep, that’s it. The valance was a bit of a project in and of itself. To finish the top, I cut a piece of velvet to fit it, then sprayed the inside of the velvet and the top of the board with a spray adhesive. Then I stretched the velvet over it and let it dry. The part that hangs was a long strip of fabric folded in half, length-wise, and serged together. Then it was sewn by hand to look gathered, and affixed to the board using hot glue. 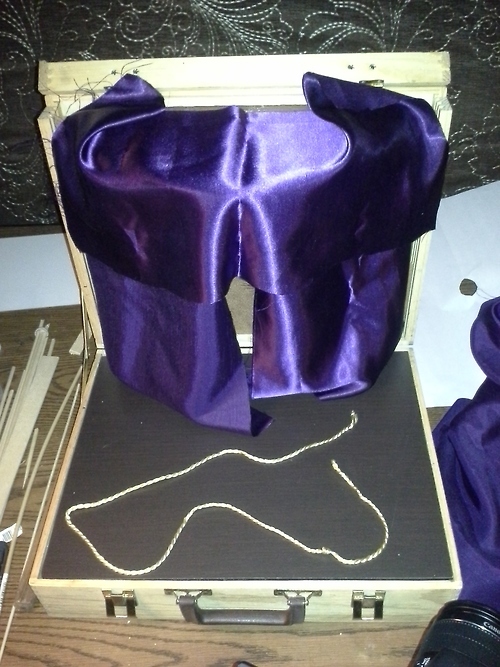 The tassels are made of the string from a Crown Royal bag, and frayed with a pin. I used white glue to make them look less frizzy. So here she is! I’m so excited to share it with you! I can’t wait to see what the outside will look like when it’s done! RAD! I can’t wait to see the stop motion that happens with this as a set. Even though I was there to see it happen, I still can’t believe how good the floor looks. 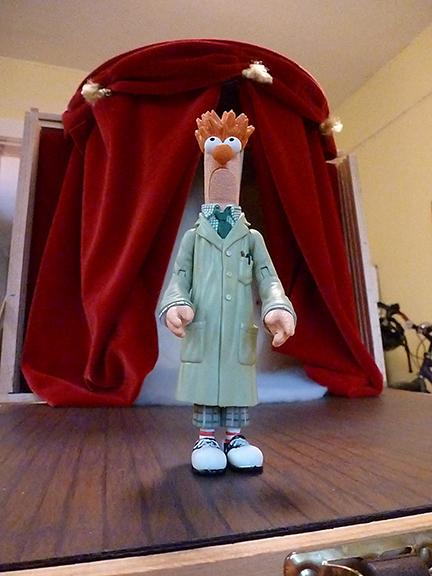 The picture with Beaker’s shoes does it some justice. Getting to see the before and after is also great, as I’d forgotten just how far the stage had to go from version 1 to the present. Emil, I totally agree. This ended up so much cooler than I ever thought possible. Bean, you’ve earned a fan for life!